Get ready for your neonatal intensive care nursing certification exam with the only review developed in collaboration with three leading nursing organizations! 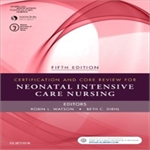 The Certification and Core Review for Neonatal Intensive Care Nursing, 5th Edition prepares you for your examination with hundreds of high-quality study questions and realistic test simulation. Based on the latest test plans of the AACN's CCRN®-Neonatal exam and the NCC's Neonatal Intensive Care Nursing (RNC-NIC) exam, review questions cover the changes to the Core Curriculum and reflect the latest evidence, essential knowledge, and best practices. New to this edition are three new chapters and 225 completely new review questions. This powerful study tool offers unparalleled preparation for your certification exam! Thoroughly UPDATED review content reflects AACN's latest CCRN®-Neonatal exam and the NCC's latest Neonatal Intensive Care Nursing (RNC-NIC) exam, information in Core Curriculum for Neonatal Intensive Care Nursing, 5th Edition, and the newest evidence-based guidelines for neonatal critical care. Three new chapters include Grieving Process, Quality Improvement, and Facilitation of Learning. Online exam simulation - included free with each new copy of the book - mirrors the test-taking experience with an interactive, timed format. NANN members save $13.95 USD or more!